Seattle, WA | Firefighters were dispatched at 1048 hours PST this morning to the 4500 block of University Way NE for a fire in a building. The building is the venue to the Hunan Chinese Kitchen Delivery formerly the Silk Road Noodle Bar restaurant, according to Yelp. Engines: 2, 9, 16, 17, 18, 22, 25, 38, 40. Ladders: 1, 4, 5, 8, 10. Medic/Aid Units: M18, A25, M31, M44. REHAB1. Staff: Safety2, Staff10, PIO, MAR5. Deputy1. Air Units: 10, 240, 260. Marshal 5, Seattle’s FIU investigative unit is currently working through the fire scene with the help of Firefighters, as they help him move things around. At this time, there is no preliminary cause of this fire. We picked up active scanner feed via the Seattle Fire radio transmissions about twenty minutes into the incident. The command name is “University Command”. At 1117 hours PST, Engine 25’s crew was tasked with a primary search on floor 2. They reported their progress was about 3/4 way through and had zero visibility. Hydraulic ventilation was also reported by another crew. A large skylight that ran down the whole length of the fire building on the Alpha side seemed to play a key role in some of the obstacles firefighters faced. At 1124 hours, it was determined there was no fire in the attic. After careful inspection and 4×4 cuts on the Charlie/Delta corner, there was no extension into the Delta exposure building. A primary search of floor was conducted at 1127 hours and an all clear was called. Ladder 1 pulled ceilings in the Charlie / Delta corner and reported an all clear. E25 reported a little fire in the cockloft. They were working on getting water on the fire. Command to Dispatch reported that the fire was under control at 1130 hours with a completed primary search with an all clear and vertical ventilation had been started. No heat was found in the ceilings but a heat signature was found due to hot spots in the interior walls at 1136 hours PST. Division 2 reported no fire in the northern rooms, overhaul had been completed and E2 crew was exiting due to low air. New replacements would be deployed by Command. A tap fire was reported to Command. Smoke began to clear on the Bravo / Delta side at 1148 hours. A secondary search on the Floor 2 was conducted by E18 at 1152 hours. Units began returning back into service at 1153 were Air260, Engines 2, 18, 25, Ladders 4, 5, 1 and the PIO. At 1233 hours, power had not been secured yet and therefore fire crews were notified that the building was still energized. Some remaining fire crews are still on-scene and remain until Command is terminated. More information will be updated as it is received. Thank you for reading our post and visiting our Blog. We appreciate you! Seattle, Washington – At approximately 1557 hours today, Seattle firefighters were dispatched to a Fire in a Building [multi-level abandoned apartment building] located at 669 S. King Street. Units dispatched were Aid 5, Air9, Battalions 5 & 6, Deputy 1, Engines 10, 2, 25, 5, 6; Ladders 1 & 3; Medic10, Rehab1, Safety2, Staff10. It was upgraded to a 2-11 with additional fire crews and apparatus being dispatched. Responding units and resources were Engines 8, 13, 30, 20, 16, 26, 32; Ladders 6, 7 & 4; PIO, Marshal5, Air260 and CommVan. Firefighters evacuated the exposure building. Firefighters are fighting the fire from a defensive point and are concerned with the top two floors collapsing. A collapse zone has been established around the burning building. Some fire apparatus have also moved away from the fire building and out of the collapse zone. Firefighters continue to work on the rooftop and from the exterior. Check out photo on #Seattle #Fire’s photo. It is reportedly that the apartment building has long been abandoned with a few businesses on the first floor. The rest of the building has been left unmaintained and its structural integrity is in question. The collapse zone is deemed all of S. King Street by Seattle Fire Department. There is no cause known at this time as firefighters are still fighting the fire. Once the fire is out and cooled, then the Fire Marshal will be able to enter the premises to locate the cause of the fire. 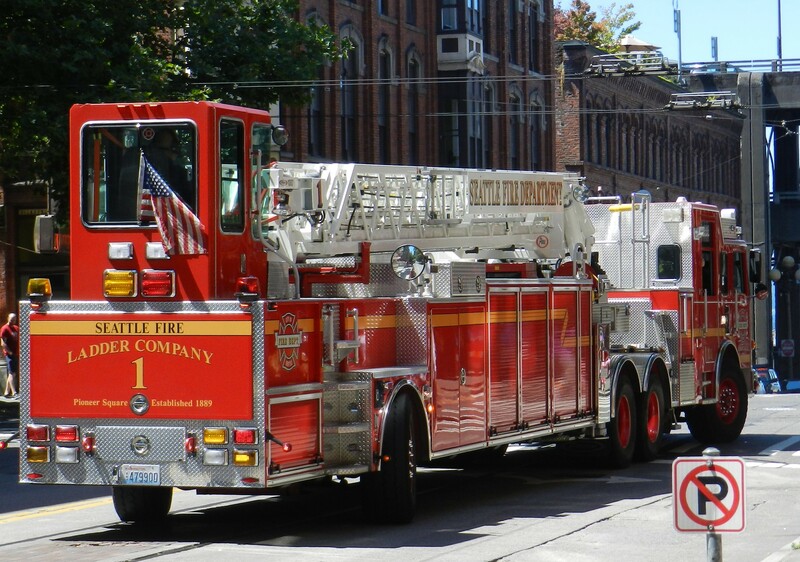 Boston, MA – Firefighters were called by the Summer Street Fire Alarm System Monitoring Company in the early hours this morning to report to a structure fire. Boston Firefighters were dispatched and reported a 5-story brick office building located at 327-333 Summer Street with smoke showing. They would later call for a 3-alarm after finding heavy fire on several floors of the building. Shortly after, fire blew out windows on floors 1-3 initiating a 7-alarm response. No injuries were reported at the time of the blow out. Evacuation sirens began to sound. Firefighters at this time repositioned their fire apparatus and deck guns on the fire. Later, the fire was upgraded to a 8-alarm fire. Major notable operations that took place during the stubborn fire with the Department of the Chief Hasson assuming Command on the fireground. The Fire Alarm Emergency Dispatch Operations conducted a PAR [an accountability system for all fire crews on the fireground]. There was no missing Firefighters reported. Firefighters were Heroic this morning when they had to forcibly open doors, enabling several cleaners to escape with their lives out the back of the building. Firefighters fought the blaze for several hours into the late morning, finally stomping on the stubborn fire that refused to be extinguished. And, for having no firefighter injuries – Everyone Goes Home Safe. 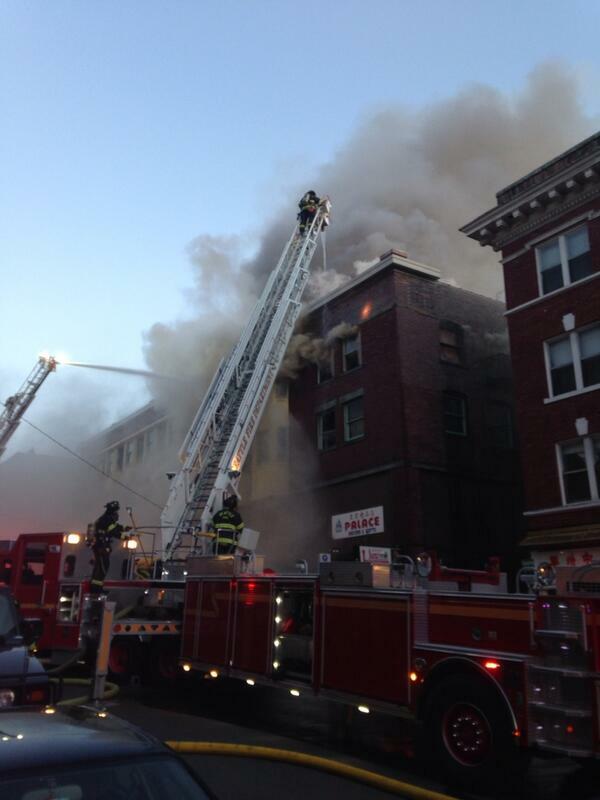 The Boston Fire Department reported at 1245 hours EST, the fire was still smoldering. It is estimated that damage to the Office Building is $2 Million. Fire Investigators had been on scene but had not been able to access the inside of the building. Cause is currently unknown at this time and the BFD states they may not have a cause for a day or two. A Structural Engineer was brought in as the Chief had concerns about a depression in the street. Streets around the building were closed but were recently opened at 1535 hours EST. Currently, there is 2-engines, 2-ladders along with a District Chief checking for hot spots. The IC and Safety Chief had entered the building checking the interior. Some reports are coming back saying that a wooden floor at the rear of the building has been burned away. A burned beam is currently holding up floor 1. We will report as soon as we receive more details about this incident.